PeteFormation Foodie Adventure: Rain Rain Go Away, I want to Cycle Everyday! My youngest son loves to cycle and he would want to ride his bicycle almost everyday. Sometimes he would bug me to take him cycling around the neighbourhood. Then, I would would have to run after him whenever he cycles too fast! Everytime when it rains, he would start to sing Rain Rain go away! LOL! Rain rain go away and come to Taiping!!!! Rain rain come to Melaka....extremely hot here!!! 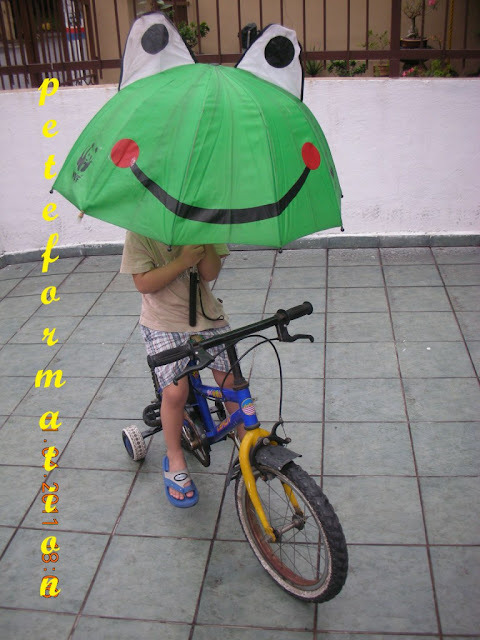 The froggy umbrella is big enough to cover him from the rain. LOL! Last time I used to one hand carry umbrella and another on the handler - expert one! Err... yalah, this auntie also like to cycle and must made it every evening without fail - rain or shine. Cycling is a form of exercise for young kids. hahaha..thats very semangat..i like that.